Issues with Antioch garage doors can be endlessly frustrating and inconvenient. When you need professional Antioch garage door repair service, however, the solution is simple. Precision Garage Door Bay Area is a local company that specializes in Antioch garage door maintenance, door track repair, door panel replacement, broken springs and beyond. Our skilled technicians can assist you with a noisy garage door, door balance troubles and more. Call us today to make an appointment for door track cleaning, garage door opener repair or a garage door safety inspection. Visit us at 35 Quail Court, Suite 301 Walnut Creek, California 94596. You can also call us (866) 949 3722. Many things can indicate the need for repair work. Door balance woes often suggest problems. An unusually noisy garage door is frequently a sign. Other potential clues include oddly slow garage door response times, drooping door areas and jerky motions. If your garage door won't close no matter what, that's a warning sign. If it won't open regardless of what you do, that's another major sign. Our firm gives customers many options in services. If you're looking for a comprehensive garage door safety inspection, our technicians can come to your aid. They can wow you with detail-oriented Antioch garage door maintenance sessions. They can offer you A+ door panel replacement, door track repair and garage door opener repair as well. When you have broken springs, our team members can turn the situation around. Our team members can help you with all kinds of garage door system concerns. If you want to forget about time-consuming and stressful garage door headaches, we're the company to call. Call us today to schedule an appointment. "Great customer service, efficient and professional. I instantly decided to install the new springs because he provided me a great customer service." "Luis is amazing! very efficient and professional. Great customer service." "Paulino was great, he fixed my garage door quickly and also got a great deal on rollers! Now our garage door is silent! Cant really hear it anymore! I am more then happy with Precision Door Services." 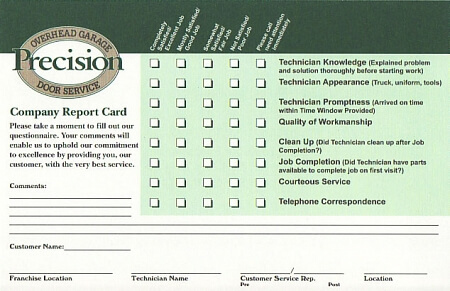 "Technician was great, we would highly recommend them for our garage door needs. Keep up the great work Precision Door Services." "Aramis was very professional and arrived on time. He assessed the situation with keen eye for detail. He started to work on our garage door opener right away. Glad we were able to get a professional and courteous young man. When he completed his job, he ran us through what he did and now our garage door is quitter then ever!! Glad we found Precision Door Services while doing online research. We would highly recommend them to our friends and family." "Can you say perfect service! Saw all the good reviews online and my car was stuck, so I called Precision. Technician was great. Called ahead to let me know when he would arrive, arrived on time, worked hard and quickly to get my garage door and garage door opener working again. Highly recommend Precision Garage Door!" "Matt was a pleasure. On time, friendly and patient in answering my questions about my garage door and garage door opener. Will recommend Precision Garage Door to friends and neighbors." "Brandon was a nice person, knowledgeable and did quality work fixing our garage door and motor. People on the phone were helpful in letting us know when he would arrive so we would not need to waiting around. Excellent service!" "This our 2nd time using Precision Door over the years. Service was excellent the first time and even better this time. Brandon was excellent. Definitely will recommend Precision door to my clients." "Paulino was on time and very professional in repairing my garage door opener." "I appreciate the courteous service and quick turnaround time Paulino from Precision Door provided in fixing my garage door and motor. Thank you." "I am a very satisfied customer. Malek did an excellent and efficient job repairing my garage door. Thank you Malek!" "Great Service! Very professional and a nice guy." "Phuong Nguyen, was a great tech.....I\'ll be using him on future services. Thanks, Terry"
"Excellent workmanship. Timely (even early) arrival.Clean work area when done and very courteous. Excellent service all throughtout and we love the materials used. Really worth the cost." "David handled the first contact with the company and did preliminary repair to close broken garage door. He end up selling us a replacement garage door. David had excellent customer service and very knowledgeable. Very courteous and respectful." "I would recommend Precision Door Service very highly. the response time was quick, service was efficiently performed and the cost was certainly affordable. I will make sure I refer Precision to my family and friends for excellent customer care. Thank you,"
"Very good job installing our beautiful new garage door. I am impressed with your company, Precision Garage Door.I am impressed with you promptness and your desire to satisfy your customer- ME. I'm Happy!! Thank You and you have a very nice technician."